Yet it is too soon to say whether Pyongyang is sincere in its stated intention of denuclearisation, or simply intent on getting optimum returns from empty promises. Understanding North Korea is in itself a cottage industry. However, there are a number of indications that understanding what Kim Jong-un wants is not so difficult after all. If we look back over the past few years, there are strong signs of change to North Korea’s motivations. On 31 March 2013, Kim Jong-un announced the Byungjin policy, which set two national goals – to pursue a powerful nuclear deterrent, and create a vibrant economy. Five years later, in April, Kim was able to declare “victory” on nuclear deterrence – confident in his ability to reach targets on the continental US – and announce a shift in focus towards economic growth. In 2015, North Korean media reported that Kim could not sleep for worry over his country’s poverty. In 2016, he announced his new “Five-Year Plan”. His emphasis on economic growth was repeated in his 2018 New Year’s Speech, when he highlighted ten industries he wanted to see expand: electric-power, metallurgy, chemical production, machine-building, natural resources, transportation, manufacturing, agriculture, tourism, and technology. Kim has also expressed his desire for economic growth outside of North Korea. In the Panmunjom Declaration, he called for steps “to promote balanced economic growth and co-prosperity of the nation”. In Singapore, he remarked on the city’s “social and economic development”, noting its cleanliness and beauty. 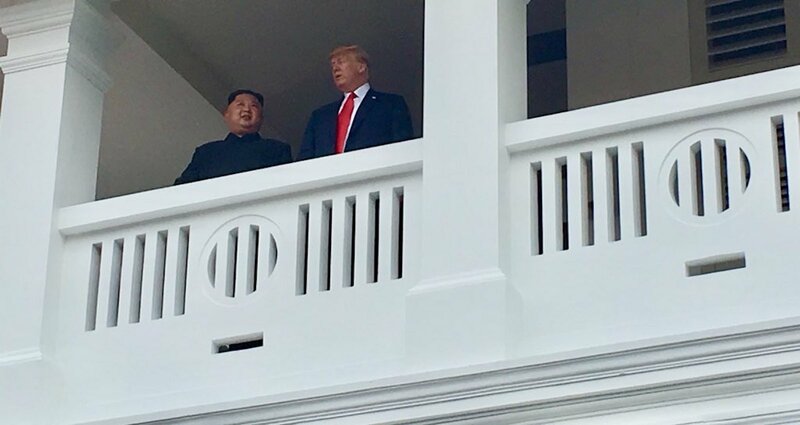 Both the remarks and the KCNA-filmed documentary – showcasing the Singapore skyline, luxurious settings, and universal access to electricity, all unheard of in North Korea – were shown to North Koreans at home. The Chinese leaders seemingly successful attempts to build a technological surveillance state, while harnessing capital to strengthen the state and the military, might have persuaded Kim that reform needn’t mean giving up control. No doubt, Xi’s decision to scrap term limits in February had as much impact in Pyongyang as it did in the West. Historically, North Korea’s leaders have criticised China’s post-Mao leaders for going soft. Now it looked as though the People’s Republic of China had pulled off a miracle: harnessing capitalism to fortify authoritarian rule. As a result, Kim might feel that opening up North Korea economically is not only viable, but necessary. Rason and Sinuiju, special economic zones in North Korea, could become the next Shenzhen and Zhuhai. The main question is whether Kim wishes to get sanctions lifted, encourage foreign investment, and keep the first part of his Byungjin policy. This is the leverage Trump needs. Pyongyang wants something he has. The conditions seem perfect for a “grand bargain”. The ultimate question is whether Kim intends to really give up his weapons in exchange for a lifting of sanctions and an opening of the North’s economy to foreign investment, or whether he intends to have his cake and eat it too. So far, it is difficult to tell. Pyongyang’s current strategy seems to offer symbolic gains – returning of remains, and site visits – instead of denuclearisation in order to get the Trump administration to declare victory and loosen economic restrictions. It has also done a bait-and-switch with a peace treaty as the path to denuclearisation. The peace treaty option has traditionally had drawbacks from the US and South Korean side, as it would disband the UN mission in South Korea and perhaps lead to a bring-the-boys-home sentiment arising inside the US. If Washington is able to exploit Kim’s desires for economic development, it could negotiate a denuclearised Korean Peninsula, partially stabilising the region, bolstering international norms, and removing at least one source of US–China friction. But if Trump is easily waylaid by Kim’s tactics, and allows Kim to win economic benefits without verifiably removing all of his nuclear capabilities, then once more we will see why policy wonks call the country the “impossible state”.